Take a heavy 4-quart pot out and pour the coconut oil in, setting the heat to medium. Once the oil’s melted and hot, add in the onion and stir frequently for 5 to 7 minutes or until the onion’s lightly browned. Toss in the ginger and garlic, stirring constantly for 30 seconds or until they’re fragrant. Now add in the following ingredients, stirring to combine: curry powder, pepper flakes, broth, soy sauce, maple syrup, and tomato paste*. Add the potatoes and carrots to the pot, putting a lid on afterwards and just waiting for it to come to a boil. Once boiling, turn the heat down so it’s just at a simmer and cook for 10 minutes or until the potatoes are tender. 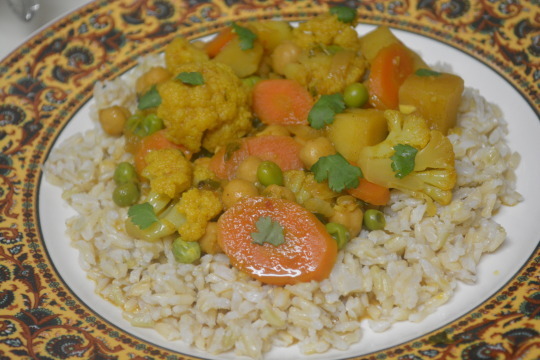 Mix in the cauliflower, chickpeas, coconut milk and the ¼ cup cilantro. Once the curry is at a simmer again, leave the lid slightly ajar and cook for 5 to 7 minutes or until the cauliflower is tender. Gently stir in the peas and cook for another minute, just to get the peas heated through. Take the pot off the heat and season with salt to taste. Serve the curry with the rice, adding cilantro to garnish on individual portions and serving with sriracha if the curry isn’t spicy enough for you. Serves 6 (1 2/3 cup per serving). *The tomato paste may not break down completely when you mix everything together but it will as it gets heated through. We like the level of heat this has on its own but that heat will get cut down a little by the rice once they’re eaten together. 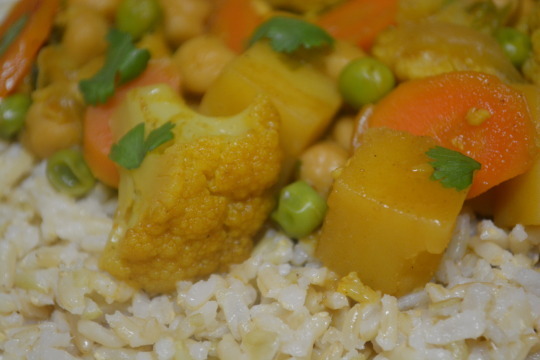 This was a very filling dish thanks to the combination of chickpeas, potatoes and the “meatiness” of the cauliflower as well. Hope you’ll like it as much as we did ! We weren’t paid in any form to promote Swanson.